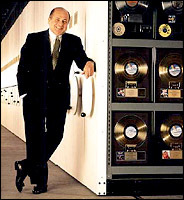 Universal Music chief Doug Morris, considered by many to be the most powerful music executive in the universe, is launching an all-out assault on iTunes with a service to be called Total Music. BusinessWeek reports that Morris is looking to join forces with other record companies to start an industry-owned all-you-can-eat subscription service tied to hardware such as MP3 players and cell phones. Sony BMG is already on-board, and Morris is also in talks with Warner Music Group. Together the three labels comprise about 75 percent of music sold in the United States. Morris and Universal’s parent company Vivendi believes the split — Apple takes 29 cents of the 99 cent sales price — is unfair and returns too much revenue to Apple. Morris recently refused to re-sign a multi-year contract with Apple to keep Universal’s music in the iTunes store, although Universal has not pulled its music from iTunes. iTunes accounts for as much as 70 percent of digital music sold. Morris hopes to move digital music beyond the iPod and iTunes on two fronts. The first is the subscription service itself, which provides an alternative to the buy-to-own iTunes model. The second deals with hardware. Instead of the best-selling iPod, Total Music’s focus will be on Microsoft’s Zune, Sony’s Playstation Portable (PSP), and other MP3 players, as well as the manufacturers of cell phones. For cell phones, the hardware manufacturers or cell carriers will absorb the cost of a roughly $5-per-month subscription fee so consumers get a device with all-they-can-listen-to music already enabled. It is not clear whether the devices will cost more to the consumer to cover Total Music fees or if they will be charged for the service through their phone bills (see our recent post ‘Universal Music Group exploring ISP file-sharing tax‘). For MP3 players, the manufacturers could enable Total Music on the device for, say, 18 months — a number that reflects how long consumers keep their music players and cell phones before upgrading. The device that may have cost $249 may now cost $339, with the additional $90 ($5 a month x 18 months) going to the music companies. In return, consumers would have complete access to the Universal, Sony BMG, and Warner Music Group catalogues. With Total Music, Morris is attempting to redefine how digital music is consumed. It’s not the only approach being tested, although it is certainly one of the more far-reaching ideas. In August Morris announced a five-month test with Wal-Mart, Google, and Best Buy to sell DRM-free music that can be played on any device. Morris and his allies are telling consumers that music is a utility like water or gas — a theme discussed in detail in Gerd Leonhard’s and David Kusek’s book The Future of Music. Buy a Total Music-enabled device or cell phone and consumers have it all — the hardware and content to play on it. The downside, as Gizmodo notes, is that Total Music is not a move away from digital rights management but towards it. Although Morris has not said this about Total Music, it’s a safe bet that the downloads to Zunes, PSPs, and cell phones will be crippled with DRM — a move away from the current trend of providing DRM-free music that can play on any device. Isn’t Total Music an assault on all digital download music stores? Isn’t it simply the labels trying to kill off all distribution except their own (via DRM)? After all, the Universal DRM-free deal with Amazon is just a 6-month trial. And what’s the point of killing the iTunes Store (and Amazon and Ovi, etc) unless they also plan to put DRM on CDs, and kill off torrents? If not, won’t Apple keep selling iPods by the bushel, and won’t people keep putting on them the songs they copy from CDs and from torrents? Where are they going to find great devices to use for Total Music, since it’s really the players that drive the store and not the other way around? Not Apple (iTunes). Not Nokia (Ovi). And if it’s another Microsoft DRM solution, how many of their PlaysforSure partners will come back for another backstabbing, uh, round? Is this how Zune and Sony plan to make a dent? Microsoft is already paying Universal $1 for each Zune; so what’s another $89? Sony already tried DRM on CDs; what’s another attempt; this time backed by all labels? Anyway, it sounds like a great plan … for the labels and the DRM-provider.